Patient rooms at Southwest Medical Center will soon get a facelift, alongside many other renovations to the SWMC campus, following unanimous approval of construction plans by both the Southwest Medical Center Board of Trustees and Seward County Commission during the month of October. This new round of changes at SWMC will improve upon an excellent standard of comfort for patients and visitors while also bringing in new, advanced services to patients in our region. 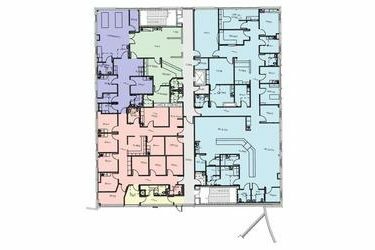 Vice-President of Operations, Michele Gillespie, explained that changes to the Medical Office Building (MOB) will involve building out one remaining suite on the first floor to accommodate for an OB/GYN practice. The second floor will also be completed to house the Central Care Cancer Center, a treatment area for new advanced wound care services, and clinic space for Southwest Medical Center’s surgeons. Completion of the MOB will also include added convenience for physicians on the second floor of the MOB, as a connecting corridor will be built to flow directly into the operating rooms on the second floor of the Patient Tower. Renovation to the second floor of the Patient Tower also includes a remodel of the sterile processing space needed to prepare instruments for surgeries. Many changes to the third and fourth floors will include updates to enhance patient comfort and adapt staff areas to accommodate for changing technologies and processes. Patient rooms on the third and fourth floors will be repainted and renovated to match the color scheme found throughout newer portions of SWMC. Rooms will also receive new patient rocker/recliners, visitor side chairs, patient tables which can be moved over beds, and flat-screen mounted televisions to replace aging furniture and technology. The third and fourth floors will also receive ADA compliant public restrooms, updated waiting areas, and new flooring. New nursing stations will also be designed to enhance workflow in the intensive care unit and on the third floor. The project will be funded through board designated funds and residual bond dollars from the 2010 renovation and expansion project. Southwest Medical Center remains one of only two hospitals in the state of Kansas that has not levied local taxes to pay for facility upgrades, services or operation costs. The project is being handled by the same two companies, Health Facilities Group and Nabholz Construction Services, who brought in their expertise on the most recent construction and remodel of Southwest Medical Center. Construction and renovation is expected to begin early next year, with expected completion in October 2015.